The Loft is an exceptional property that we believe will meet, and most likely, exceed your expectations. If for some reason it doesn't, we ask that you let us know right away so that we can do everything within our power to make that so. If for some reason we are not able to meet your needs, we will offer you an appropriate discount on your stay or, at your choice, refund your money and assist you in locating other local accommodations. We have been renting this property for eight years now with dozens of five star reviews which you can read on this website and others. Please click on the video icon in the upper left hand corner of the picture above to view a video of The Loft. Please take a moment or two to read some of the other wonderful reviews from previous guests posted below! The Loft was designed and created by us for those of you looking for the ultimate getaway. Here you can relax in privacy, feel pampered while enjoying up-scale amenities, unobstructed views, and peaceful, natural surroundings. The Loft itself is approximately 500 square feet in size and is the second story of a completely finished building which we use for storage and a workshop. Our home is also on the property, however the purposeful orientation of the two separate buildings allows for total privacy for our guests. There is an inviting, separate and gated entrance leading around to the backside of the building housing The Loft. Once around the backside, you will find towering evergreens, a wonderful private patio with a hot tub and gas BBQ...and a beautiful view of Sequim Bay out into the Strait. Relax in the comfortable patio furniture and enjoy the pleasing ambiance of trees, water and solitude. Beyond the patio and landscaped yard, and on the hills behind are tall evergreens that extend up to high peaks within Olympic National Park. It is not uncommon to have eagles flying overhead, deer in the lower grassy areas and visits from bunnies. We originally envisioned building this space for our family and friends to use while visiting. So we wanted it to be very special even from the beginning. As the project progressed, we decided to offer it on VRBO (which we had used many times ourselves). So we doubled our efforts to create a place that felt warm, cozy, romantic and luxurious. We even provide spa towels and robes! We decorated The Loft using vibrant and inviting colors. We used natural slate, granite, a heated tile floor, upscale fixtures and solid cherry woodwork/trim throughout to accomplish our vision. One of our favorite features in The Loft is the gas fireplace. We spent hours designing and installing it. Surrounded with natural slate tiles it has a hand crafted mantle of solid cherry and truly is 'one of a kind'. We planned the furniture and fireplace arrangement so that the fireplace, wall mounted HDTV, and straight on view of Sequim Bay can all be enjoyed from the comfort of the bed! We also installed 'stealth' stereo speakers in the walls...they are invisible! The balcony of The Loft overlooks the bay and is a wonderful place to just 'be'. We are in a gated community comprised of five-acre properties. Ours is located on the top of the hill, at the end of a cul-de-sac. It is the last of only three homes situated on the street. We feel we accomplished our goal of creating a very special place, and are pleased to offer it for your stay in Sequim. Our central location on the north end of the Olympic Peninsula makes this a great place to stay while enjoying the numerous activities available in the area. 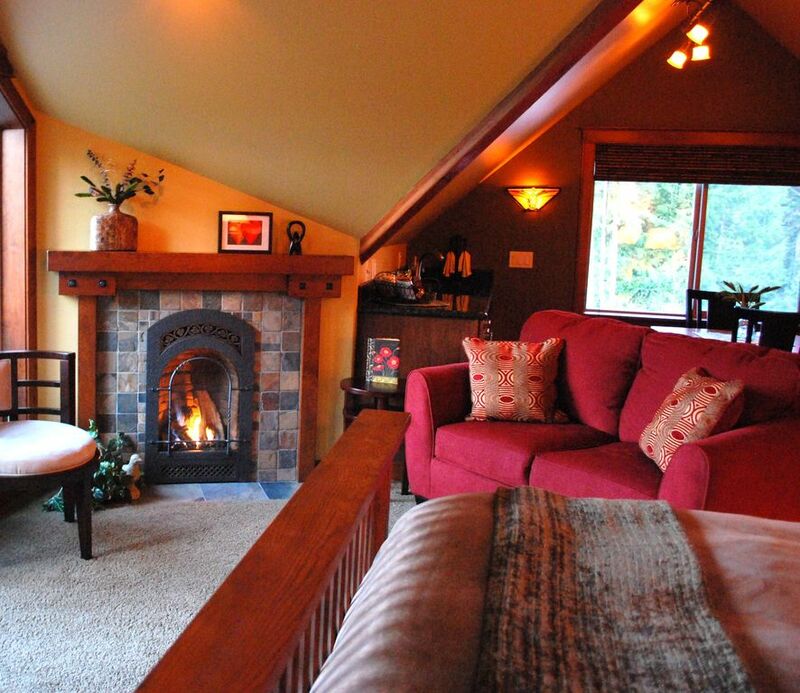 We invite you to come stay in The Loft and experience for yourself a truly unique retreat. The Loft is the place to stay when you wish to spend time creating lasting memories with someone special. Great care is taken to ensure that your stay at The Loft is comfortable, relaxed and leaves you feeling that you can't wait to return! The Loft is thoroughly cleaned before each guest arrives. We pride ourselves on offering a five star experience for our guests. The Loft is about a ten minute drive from Sequim and about 20 minutes drive to Port Angles. “Port Angeles/Sequim is a gateway to Olympic National Park. Because of the dramatic relief —the peaks rise to over 5,000 feet within a few miles of the coast — the area hosts diverse ecosystems, including alpine environments studded with lakes, ultragreen old-growth forests threaded with whitewater rivers, and bays that harbor orcas and steelhead. -LAVENDAR FESTIVAL (July): Sequim is the 'Lavender Capital of North America' with a dozen lavender farms offering tours and their special lavender products. Many farms are open throughout the year. During the festival most farms offer a tasty selection of food and beverages along with some great entertainment on site. In town you'll find a large street fair. -IRRIGATION FESTIVAL (May): This local festival features a well populated street market, carnival, parade and logging events. -SEVEN CEDARS CASINO: Live entertainment, dancing, restaurants and gaming. Just a short five minute drive. We bought our 'retirement' property in Sequim the day after we first saw it in 1999. I had found it listed on the internet and when we arrived to check it out, we just couldn't leave. We decided to spend the night in town and come back the next day to see if it still had the same affect on us. It did. The sunsets of summer here are gorgeous; purple and gold and red...and on that day the sunset was spectacular. So when we came back the next day with a picnic lunch we knew had to own this land. We ended up moving here full time much sooner than we had originally anticipated but everything happens for a reason, right? It has turned out to be one of the best decisions we've ever made. Our daughter attends Washington State University and just completed her junior year. You will surely meet Hannah, our friendly yellow lab during your visit. Sequim has long been known as a wonderful retirement spot. We chose to buy here because of the small town size (but growing), the fact that it's only a couple hours from Seattle, has a great marina (the John Wayne Marina)to suit our boating needs, and the fact that Sequim gets very little rain compared to the rest of this side of Washington state. There really is not one spot on this land that doesn't have a view. Whether it mountains, forested hills, ever-changing water views of Sequim Bay and the shipping lanes beyond, or the San Juan Islands. No one ever comes here without exclaiming about our view. Even people who have lived in this area all their lives are amazed. The bath is a 3/4 meaning it has a shower, but no tub. Gorgeous views of Mt. Baker from the balcony. Watch the sun rise illuminate the mountain...feels like you could reach out and touch it! The views of Sequim Bay and the Strait of Juan de Fuca beyond provide a variety of interesting scenery and boating activity to enjoy. They are a feature of our property our guests rave about the most! There are NO OBSTRUCTIONS to this amazing view. See the cruise ships out of Seattle on their way to sea and then back to port. View pleasure boating activity on Sequim Bay and in the Strait of Juan de Fuca. Use the binoculars provided to view the San Juan Islands and the Canadian San Juans as well on a really clear day. Look east over Sequim Bay and enjoy the sun rising over Mt. Baker. You won't tire of looking at the myriad of views available from The Loft! Quality bedding. Hair dryer, plush robes, eco friendly soaps and hair products provided. Parking in front of The Loft, and reserved for your use. 4.2 cu ft with small freezer compartment. A larger fridge downstairs is available on request. Though we do not have a stove, we do have a electric skillet. This is also a convection oven, for baking, roasting, etc. Seasonings, olive oil, foil, plastic wrap, zip lock storage bags, napkins, paper towels. Dishes, bar ware, glasses, cooking and serving dishes, silverware. Microwave/Convection oven combo, toaster, coffee maker, small fridge, blender, electric skillet and waffle maker.Complimentary coffee, tea and cocoa. Larger fridge downstairs available on request. DirecTV, Roku, Netflix, Pandora, etc. Lawn and garden beds bordered by tall evergreens. A roomy 6'x16', trex decking, see-thru railing to maximize the panoramic view, chairs and small table. Rentals are available nearby at the John Wayne Marina. Private patio,views of the Strait of Juan de Fuca, Sequim Bay and the San Juan islands. Hot tub, comfy outdoor furniture, outdoor speaker. A wonderful place to relax and enjoy nature. Fenced and private, on private patio with evergreens to one side and the water view in front of you! Beautiful place. Serene. Loved our visit! Everything you need to relax and leave the world behind. Well done on the decor, amenities and location. This place is calm, quiet and beautiful. Wonderful and cozy! Great spot for a romantic getaway! Clean. Beautiful view and private. Great view. Loved the hot tub. The loft was clean and provided everything we meeded. 2nd visit and still loved it! We loved everything about the Loft. Great location for day hiking in Olympic National Park, and soaking in the hot tub at the end of a long day was heavenly. The view from the balcony was incredible, and the perfect spot for stargazing at night. We'll be back!